If you've decided to go off the grid one of the first things you probably did was hook up solar panels and wind turbines to a battery system for your home. Once you're done that you are getting your power from the sun and wind, so the next logical step is to get yourself a way to deal with your water and sewage. The fabulous thing about water is that it's everywhere - it runs beneath your feet as groundwater and falls from the sky as rain. You can tap into both of these sources in order to go off the grid - even if you live in a city you can do this! According to the American EPA, roughly 15 percent of homes in the United States get their water on their own, so there's no reason why you can't be one of them. (Most of that 15% is farmers with their own wells.) There are approx. 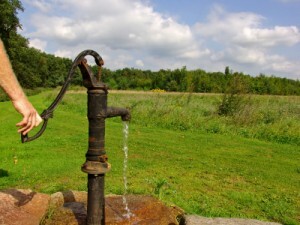 20 million homes in the United States that get their water from private wells. The principle is simple - a hole is dug or drilled deep into the ground and a pump draws out the water using electricity or even wind power (Mennonites use windmills to bring up their water). There are many government regulations that apply to private wells, so you should only use a licensed well driller. It's easy for harmful contaminants to leak into your well if it's not installed properly. The cost of a private well ranges from about $3,000 to $15,000, depending on how deep you need to go. The deeper the well, the more likely you'll find clean water from an aquifer. Add plumbing, install a filter for better-tasting water and voila, done! Another benefit of a private well is that you'll be able to avoid local watering restrictions during periods of drought. It is YOUR well and you can decide what to do with it. Another way you can provide your own water is by harvesting the rain with a cistern. A cistern is basically a tank that holds water. Home cistern systems have large above-ground or underground tanks made from concrete, steel or fiberglass. The water from your rain gutters is channeled into the cistern and then pumped back into your home as you need it. If your cistern is above ground and higher than your faucets, you can use the weight of the water as pressure to get it into your home. Below-ground cisterns require a pump to get the water to you, much like a well. If you want a cistern, you need to live in an area that gets enough rain. If you live near a major source of pollution, like a major expressway or factory, then you should avoid going with a cistern because the water will be pretty disgusting. If you want drinkable water, it's best to have a metal or clay roof because it's cleaner than a shingled one. Shingled roofs can be used, but they require a pre-filtering system before the water is deposited into the tank. If you're interested in harvesting rainwater, consult a local green building professional. The best way to get off the grid's sewer line is to install a septic system. A septic system is basically a large metal tank that collects and releases your waste-water. Bacteria in the tank break everything down causing it to separate naturally into a top scum layer, bottom sludge layer and middle liquid layer. As new waste-water flows in, the liquid in the tank flows out into a series of buried perforated pipes that release the water over distance into a drain field. Soil acts as a biological filter, keeping the harmful bacteria buried beneath the ground until it's eventually absorbed and becomes nutrients. The tank should be emptied and serviced by a professional once a year if its being used often. Note: The plants growing above a septic tank system pipes always grow the best because they are getting lots more fertilizer and nutrients. So that is a great spot to build a greenhouse, over the pipes.